How confused are you about big data? Customers often ask me whether Dataguise is an analytical shop. I answer by describing what big data is: even though it’s as powerful as a storm, it’s a deluge that must be controlled in a positive way to provide business with unprecedented insights and value. A month ago, I had the honor to attend the Hadoop Summit in San Jose. 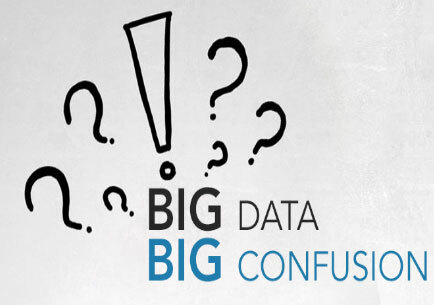 At the event I heard big data defined in many different ways, so I am not surprised there’s so much confusion surrounding the term. width=”300″ height=”211″ />The question then becomes: how should CMOs or C-suite executives define big data? Big data is a collection of data from traditional and digital sources inside and outside your company that depicts a source of ongoing discovery and analysis. It can be constrained to digital inputs like web behavior and social network interactions as well as financial records, product transaction information, and interaction channels. The volume of digital data is growing at an exponential rate, which means big data is only going to get bigger—and bigger. When defining big data, it’s also important to understand the mix of unstructured and structured data that compromises the volume of information. Unstructured data comes from information that is not organized or easily interpreted by traditional databases or data models, and typically, it’s text-heavy. Jeremy Stieglitz, Vice President of Product Management at Dataguise, likes to describe it as unorganized laundry: “Your dirty socks, shirts, or pants go in your dirty laundry basket… you throw these things in this basket throughout the week and they are not organized because you are not matching every sock pair—this would be called unstructured ‘laundry’.” Now apply the concept of your dirty laundry basket to your data. People around the world are creating unstructured data without organizing it. Structured data resides in fixed fields within a record or file. Relational databases and spreadsheets are good examples of structured data. Using Jeremy’s analogy, you can describe it as your clean laundry that you organize in your closet after washing it. Think of your structured data as your clean yet organized laundry. The matching socks are in one drawer while your folded pants and t-shirts are in other separate drawer. Every enterprise needs to fully understand big data—what it means to them and what it can do to drive growth for their business, and that’s where Dataguise comes into the picture. Acting now is paramount. Waiting will only delay the inevitable and make it even more difficult to unravel the confusion surrounding your big data. Once you gain a firm understanding of your organization’s big data, you’ll be empowered to take steps to protect it. Best of all, you can use the insights you gather at each step along the way to start improving your business, adding more value to both your offline and online interactions.